Amazon.com description: Product Description: Jackâs mom is gone, leaving him all alone on a campsite in Maine. Can he find his way back to Boston before the authorities realize what happened? Ever since Jack can remember, his mom has been unpredictable, sometimes loving and fun, other times caught in a whirlwind of energy and "spinning" wildly until itâs over. But Jack never thought his mom would take off during the night and leave him at a campground in Acadia National Park, with no way to reach her and barely enough money for food. Any other kid would report his mom gone, but Jack knows by now that he needs to figure things out for himself - starting with how to get from the backwoods of Maine to his home in Boston before DSS catches on. 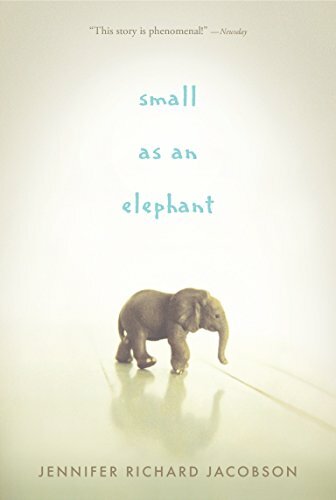 With nothing but a small toy elephant to keep him company, Jack begins the long journey south, a journey that will test his wits and his loyalties - and his trust that he may be part of a larger herd after all.